Successful trials of CharIoT, a unique new system that simultaneously records temperature, humidity and energy use in the home, have opened the way for low-income households to save money while reducing risks to their health. The universities of Southampton and Nottingham and the Centre for Sustainable Energy (CSE), developed Chariot with funding from the Engineering and Physical Sciences Research Council (EPSRC). Harnessing Internet of Things (IoT) technology, the system generates easy-to-use data that can help local authorities, housing associations, energy suppliers, health authorities and others to target and tailor the energy advice they give to vulnerable people. As well as revealing under-heated or over-heated parts of a home, Chariot enables energy advisors to pinpoint where and why damp or mould may pose a problem. They can then suggest, for example, ways of using heaters more efficiently and cost-effectively, blocking draughts and eliminating dampness through better ventilation. 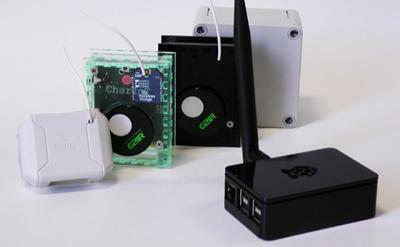 Each Chariot kit includes three small wireless sensors that regularly record the temperature and humidity in the rooms they are placed in, and wireless devices that monitor gas and electricity consumption. Data is forwarded to and stored securely in the ‘cloud’ and later analysed via tablet or computer using a simple-to-use web-based interface. Chariot has now been trialled in over 20 low-income homes. A user guide helps energy advisors to make the most of the graphs and tables that the system generates and to provide tips geared to individual households’ needs – including measures as simple as fitting thicker curtains or loft insulation, or improving air circulation. Of potential value to all households and not just low-income ones, Chariot is now being promoted to potential user organisations across the UK and the team is exploring ways of adding further functionality. Cold or damp can exacerbate medical conditions ranging from colds, flu, arthritis and asthma to chronic obstructive pulmonary disease (COPD), circulatory diseases and mental illness. In total, nearly 1 million people in the UK suffer from COPD, for example, while cardio-vascular disease causes 42,000 premature deaths a year. People in the coldest houses can be most at risk. Researchers from the University of Southampton’s Agents, Interaction, and Complexity Group (AIC) developed the sensor boards, algorithms, and user interfaces that were deployed during the project. The challenge was to ensure the kit was cheap enough to deploy at scale, and that the data visualisation employed was legible to a non-expert.